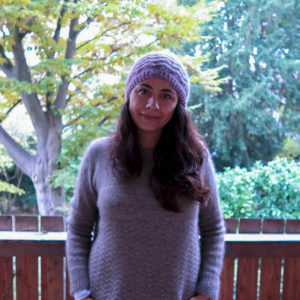 I am Claudia Gabriela, the person behind Isalloni Yarn. I was born in Bolivia and since 2006 I live in Switzerland with my beloved husband Adrian and Max, my furry baby. I am a passionate knitter and I truly love yarn and the process of making it. This love made me to start dyeing and playing with colors. It has been a long journey since the first time I went to a trade fair in Cologne, Germany to find suppliers until today. I started dyeing yarn commercially in 2015, and with the help of my husband, I participated in local events as a vendor. The yarn initially had my own name Gabriela Kos, but I wanted to give a new name that represents my origins. That is how Isalloni was born. I could not find a better word to describe me and where I come from. I remember when I was a little girl, my grandma and nanny used to buy raw wool from the farmers to spin and knit with it. The first thing I recall they made was a shawl in natural color. It was white as a veil, with basic cables and lace. I remember the whole process of making the yarn. Those skeins spun with a traditional spindle, so pristine. This shawl protected me from cold winters, and I could feel the warmth love they put on every time I was wearing it. I want to share the same love with you through my yarn, and dedicate my work to these beautiful ladies who introduced me to the world of yarn makers.